Rice Noodle Roll (known as Steamed Rice Roll) is a CANTONESE dish from Southern China including Hong Kong. Served as a snack, small meal or as a variety of DIM SUM. You can find some filled with shrimp, beef, vegetables, or other ingredients. It's seasoning comes variety as well, soy sauce and sometimes siu mei drippings, poured over the dish upon serving. 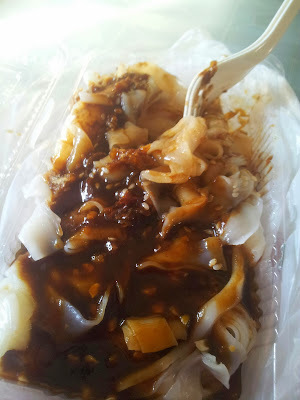 If plain and made without filling,it's known as CHEE CHEONG FUN. Made of 1 cup of Rice Flour and 1/4 Tapioca or Glutinous Rice Flour and Water. These mixture is poured into a specially made flat pan with holes, steamed in the pan from the bottom up and thickness is about 1/8 thickness. I like mine with HOISIN SAUCE.Getting a halal one is not difficult, you can get them at http://www.nyonyacolors.com/ at any of their outlet. Another one is at http://www.chendul.my/ but it's the teochew way.